JCDecaux S.A. (Euronext Paris: DEC), the number one outdoor advertising company worldwide, announced that it has started the roll out of its smart and digital street furniture in 34 cities in Hauts-de-Seine (total population: around 1.6 million), under its new exclusive contract with the Department Council. 72 latest-generation digital street furniture units equipped with Ultra HD 86’’ LCD screens offering unrivalled outdoor image quality: strategically positioned across the entire area, they alternate between real-time local information and advertising, providing useful information for the public and exceptional visibility for advertisers. A third of the installation programme has already been completed (32 units), and the rest should be in place by summer 2019. 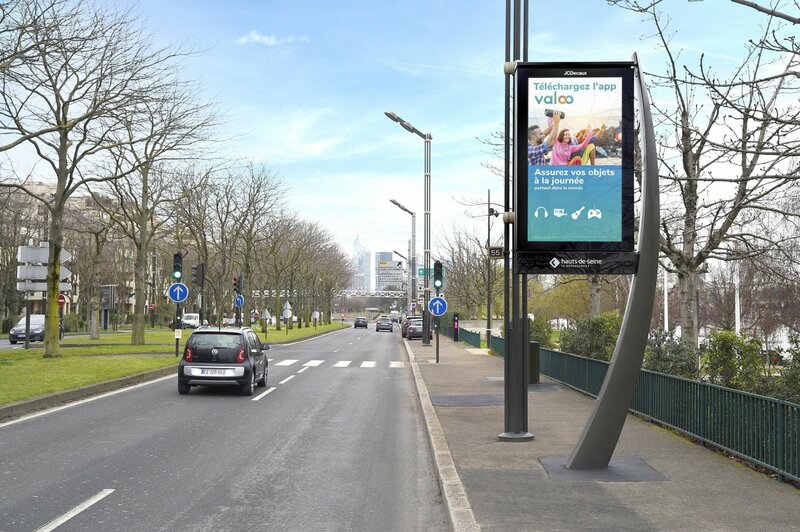 This is the first time that a Department Council in France has provided premium digital street furniture that incorporates useful and contextualised information, creating closer communications with its citizens. Designed by Carlos Bratke, an iconic name in Brazilian architecture, these new modern and elegant street furniture units will integrate perfectly with the urban architecture and the diversity of the 34 towns, while offering optimal visual coherence across the department. Consistent with its sustainable development strategy, JCDecaux has made strong commitments to control the environmental impacts linked to this new contract: eco-design of the street furniture units, optimised energy efficiency, less use of transport, conservation of resources, and analysis of the life cycle of the street furniture.